I LOVE upcycling old and vintage furniture into something new. It's great to take an old chair or table and give it a new lease of life. Sometimes just a new coat of paint can really transform a piece of furniture. 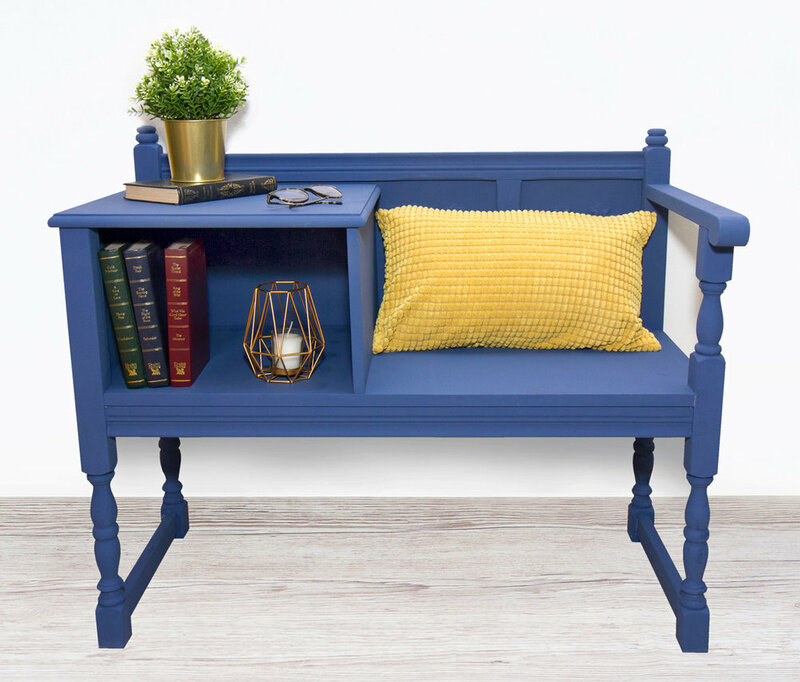 In this upcycling project I have upcycled a vintage telephone table into a contemporary reading bench. I wanted to turn the cupboard into a shelf to store books, so I got a small screwdriver and removed the hinges to remove the cupboard door. Then I filled the holes with wood filler, and once that had dried I lightly sanded the whole telephone table/chair. Once I had sanded the furniture, I wiped it clean with a damp cloth. Then I covered it in a coat of Rust Oleum ink blue chalk paint (love this colour!) and left it to dry. Luckily chalk paint dries really fast so I didn't have to wait too long! I then covered it in a second coat, and that was all that was needed as the coverage of the chalk paint was really good. I used a paintbrush to paint the edges, then filled everything else in with a roller. I prefer the finished look when it is painted using a roller, the paint appears more even. Finally, once the paint was completely dry, I covered the telephone table (now reading bench) in a thin coat of wax to protect it. I then added some old books, and a yellow cushion for contrast. This bench is now a lovely reading nook to sit and read a good book! See here for more home craft ideas!